Sometimes all you need from a film is to be entertained. A movie doesn’t always have to be uproariously funny, thrilling and dramatic or even scary. To have your interest peaked for ninety minutes is all some movies need to do and Eddie the Eagle does that perfectly. There is nothing too different about Eddie Edwards’ story. It is an underdog tale. A young boy who is less than athletic and seems destined to be a plasterer like his Dad follows his dreams to compete at the Olympics. Not win a medal necessarily, just compete. This movie is his sweet, good-natured journey to do just that. No great dramatic moments. There aren’t heart-string pulling scenes or moments where lives are lost or worlds fall apart. Luckily, there doesn’t need to be. That is because Eddie The Eagle’s story is a true one. If this had been created by a writer, trying to put together the next great sports movie, there would be over-zealous emotional beats, an evil villain and an over-exaggerated third act finale which the audience could see coming a mile off. Instead, because it is based on a true story, the tale feels slightly more “real.” It is still full of the cliches and there is plenty that sports movie fans would have seen many times before, done much better, but because the film depicts events people know and remember, you forgive a lot of the familiarity. It also helps that the characters themselves are depicted so well. After impressing in Kingsman, Taron Egerton takes a very different role as the lovable loser Eddie Edwards. He manages to embody the character very well, balancing the fine line between comedy foil to believable Olympic athlete. As if this wasn’t hard enough, he is then supported by Hugh Jackman. Jackman plays fictional character Bronson Peary, giving Egerton’s Edwards someone to bounce off and interact with, as well as adding some depth to the movie. 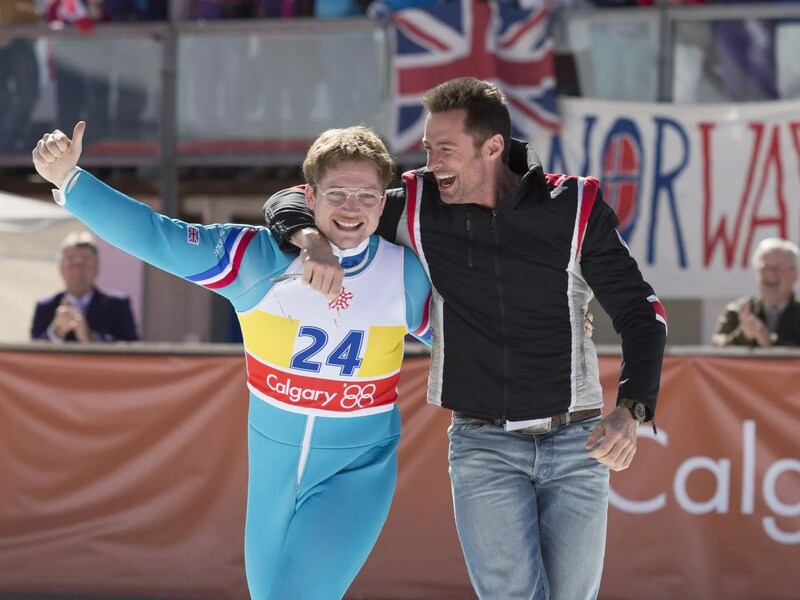 Jackman cruises through but is clearly having fun, particularly in the mandatory sports movie training montage. The rest of the cast is made-up of classic British talent, from Jim Broadbent to Tim McInnerny but it is Keith Allen who manages to steal most scenes he is in. As Eddie’s Dad, he is the cynical, defeatist and traditional character which every sports film seems to need. He also delivers that performance well, adding a vein of humour through the middle of the movie. It is another example of how familiar and safe the movie is. There is nothing wrong with this but for anyone looking for a hard hitting biopic or shocking true story tale, they are looking in the wrong place. This is a feel-good movie which tells an interesting story about a likable hero. Overall, Eddie the Eagle won’t win any awards or medals but like it’s central character, it doesn’t need to. It is a film that will feel familiar, won’t shock, astonish or change any lives but will entertain. The performances are solid, the story believable and the whole experience entertaining; which is what movies are about. Great review thank you. I didnt expect to hear the audience cry at this one, but sure enough they did. I loved it too. Drop in for a read of my take on this film. I’m now a follower too. I could understand the tears. It was a pretty emotional ending.